Pakistan’s Abid Ali registered his name in the record books when he scored century on ODI debut against Australia on March 29, 2019. In the process he became the 3rd Pakistani batsman to have this record against their name. Abid Ali is the second oldest batsman to have scored century on ODI debut at an age of 31 years and 164 days. Interestingly in 4119 One Day International matches played since inception of this form of the game only 15 players have achieved this feat so far. The first batsman to have achieved this feat was England’s Dennis Amiss when he scored 103 runs against Australia in only 2nd ODI played internationally on 24th August, 1972. Pakistan’s Saleem Elahi is the youngest player to have scored One Day International century on debut, he scored 102 not out vs. Srilanka at Gujranwala at on 29th Sep, 1995 at an age of 18 years and 312 days. Oldest player to score ODI century was scored by England’s Michael Lumb who scored 106 vs. West Indies on 28th Feb, 2014 when he was aged as 34 years and 16 days. Highest score by an ODI debutant’s record was named against the name of Caribbean dasher Desmond Haynes, who scored 148 against Australia at St. Johns 22nd Feb, 1978. South Africa’s Reza Hendricks has scored fastest century on ODI debut when he complete his century against Sri Lanka on just 88 balls at Pallekele. 3 players each from Pakistan and South Africa, 2 from England & New Zealand, 1 each from Australia, India, Zimbabwe, Hong Kong and West Indies have scored century on their ODI debut. 11 times players have made their team win the match by scoring century on ODI debut whereas 3 time batsman were on the losing side and one match have no result. 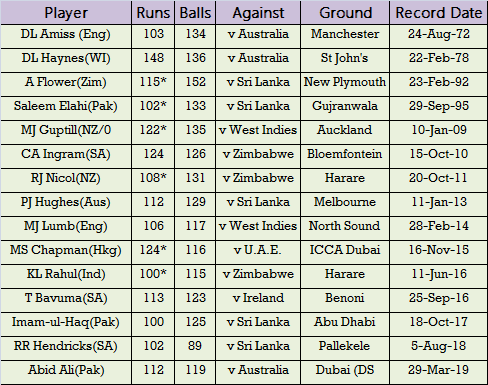 12 times players have won man of the match awards on their record performance of century on ODI debut, whereas twice players have not won the award despite scoring century on debut. And for one match there was no award given during the match.